Dalston Lane In Hackney (currently under construction) will reach 33 metres when complete later this year. Work has started in Vancouver on a building that will take the timber tower, aka ‘the plyscraper’, to a new level. The 18-storey student residence at the University of British Columbia is being built out of a super-plywood called cross-laminated timber (CLT). When complete, it will be the tallest wooden skyscraper in the world and almost double the height of any other timber tower in North America. 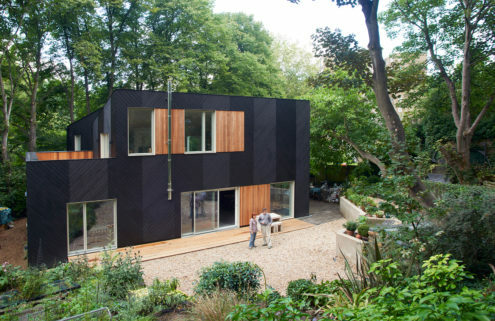 CLT is an attractive and versatile building material: ecologically sustainable, it allows structures to be built quicker, cheaper and quieter than using traditional methods. The material first grabbed global attention in 2008 when architect Waugh Thistleton completed the nine-storey Murray Grove in London. 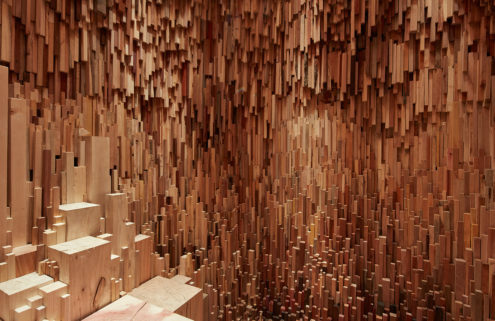 Since then, several towers of similar height have been built using CLT technology, but now a new generation of plyscrapers is pushing the boundaries, with plans for even taller timber towers being announced across the world. We look at seven timber towers engaging in a game of one-upmanship as they vie to be the world’s tallest wooden building. This 10-storey apartment block took the title of the world’s tallest CLT building from London’s Murray Grove when it was constructed in 2012. Australia’s first timber high-rise was designed and built by developer Lendlease and is the country’s greenest apartment complex. Using CLT, rather than steel and concrete, meant CO2-equivalent emissions from construction were reduced by 1,400 tonnes. The project took just 11 months to build (four months less than standard for a building of its size). 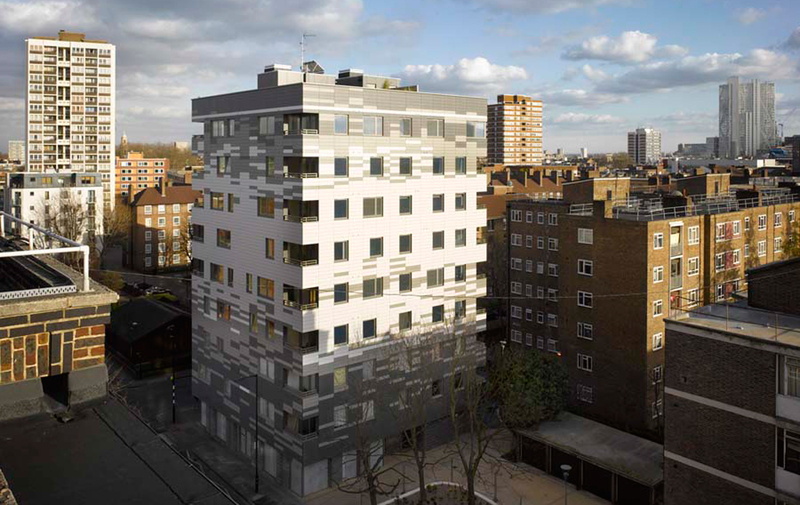 The Cube is one of several timber new builds in the London Borough of Hackney that followed Murray Grove. The innovative, twisting 10-storey residential tower was completed in 2015 and designed by Hawkins \ Brown. It is currently the tallest timber building in the world at 33 metres and combines timber with steel to create a hybrid structure. 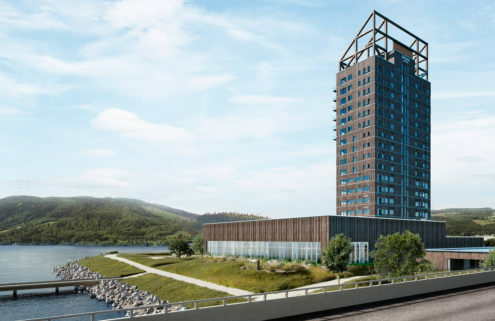 Dubbed The Tree, this 14-storey timber tower is nearing completion in the Norwegian city of Bergen and will shortly take the title of world’s tallest timber tower from the Cube in London. Glulam timber structural columns up to half a metre thick will hold up the 49 metre building, which is made up of energy-efficient, stacked prefabricated modular apartments designed by Norwegian practice Artec. You can watch a stream of The Tree’s construction here. Renders courtesy of Artec. Another CLT building under construction in London’s Borough of Hackney, this cluster of residential blocks will equal the nearby Cube in height. Designed by the architect of Murray Grove, Waugh Thistleton, the 121-unit residential plywood building will last for up to 150 years, and can be recycled at the end of its lifespan. Work started on site recently at the University British Columbia in Vancouver on this 18-storey plyscraper, which will set a new benchmark for wooden buildings. Not only will the student residence surpass leading American CLT advocate Michael Green’s recently completed Wood Innovation and Design Center as North America’s tallest wooden building – it will also become the world’s tallest timber tower when complete in the summer of 2017. 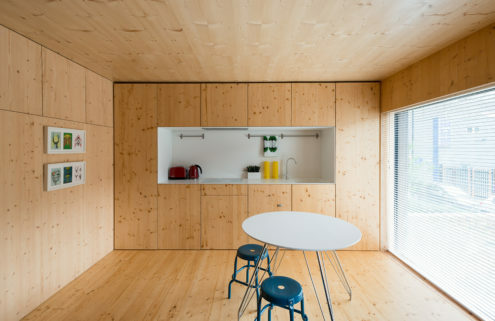 It has been designed by Canadian practice Acton Ostry Architects with Austrian practice Architekten Hermann Kaufmann acting as tall wood advisors. One of several proposed plyscrapers on the drawing board, HOHO is a 25-storey wooden skyscraper in Vienna being mooted by local architect Rüdiger Lainer & Partner. With a proposed height of 84 metres, the tower would be 75% timber wrapped around a reinforced concrete core, and would dwarf those currently under construction. Another proposed timber tower, this elegant 34-storey residential skyscraper would be constructed with pillars and beams of solid wood. The tower has been designed by Danish architecture practice CF Møller, and is hoped to be built by 2023 to celebrate housing co-operative HSB’s 100th anniversary.